From magazines to Pinterest, the big trend nowadays is whitening your teeth with charcoal. 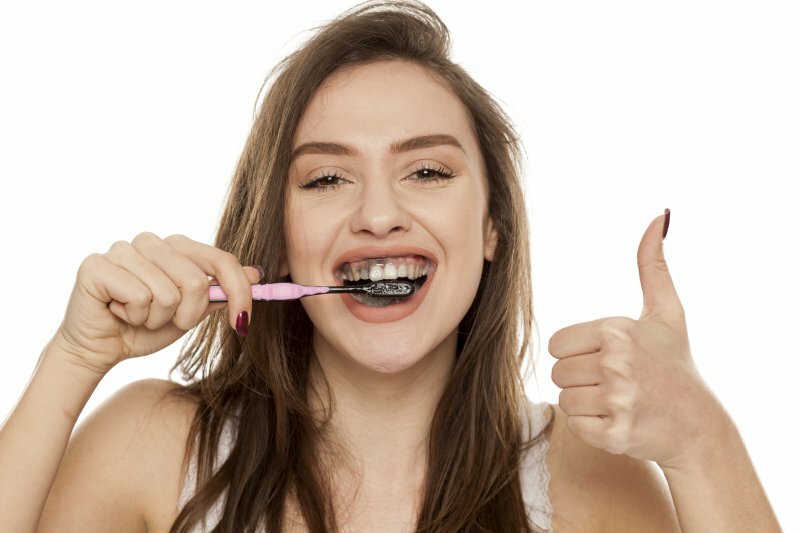 Although regular gels and whitening trays are still found on drug store shelves, you may find that the charcoal alternative is becoming a more popular choice. But does it really work? Isn’t charcoal used for barbecues? Can this dark substance that makes your teeth look dirty actually brighten your smile? Your dentist weighs in on the topic and discusses how and if this new whitening trend actually works. You’re probably envisioning those hard briquettes used in a barbecue, right? Well, when it comes to activated charcoal, that is something completely different. The charcoal substance we’re referring to is used to adsorb the things we don’t want in our mouth like stains. By adsorbing, we mean using a substance to bind something we don’t want the body to absorb. For instance, if you swallowed a harmful chemical and called for help, paramedics might have you swallow activated charcoal so it will bind to the chemical and keep it from absorbing into your body. When people caught on the magic of charcoal and how it works, it became a worldwide phenomenon to use it to whiten teeth. When Charcoal Meets Your Teeth: What Happens? Now that you know a bit more about how activated charcoal works, let’s find out if it can whiten your teeth. As soon as you dip your toothbrush into the substance and begin brushing, you may notice that it will remove some of the stains on the surface of your teeth; however, it is only temporary. Proper research has not been done to determine if it harms your teeth or how abrasive it may be to your tooth enamel, which means it’s probably not the best solution for whitening your teeth. Once you lose enough tooth enamel, your teeth can become sensitive, making eating and drinking much more difficult. But don’t worry! Just because charcoal may not be what your dentist recommends, there are other teeth whitening options available. One recommended treatment option is an at-home whitening kit. You’re obviously wanting something you can do at home, so why not let your dentist provide customized application trays and professional whitening gel to give you a brighter smile? With proper wear, you’ll notice a significant difference in your smile in just two weeks! Sometimes, the latest trends aren’t always the safest. When it comes to your oral health, why take the chance? If you want to whiten your teeth, and you’ve heard about the latest craze, talk to your dentist. It’s not worth the risk, especially when you could cause damage to your precious pearly whites. Dr. Jaclyn Jensen earned a doctor of dental surgery degree from the University of Minnesota in 2006. Focusing on patient comfort, she is committed to improving the health of her patients by using state-of-the-art technology and continuing education. If you’re looking to whiten your smile, Dr. Jensen can help you look and feel your best with cosmetic dentistry services. For questions about our services and how we can help you, visit our website or call (218) 281-1301.